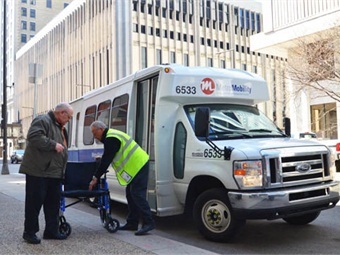 MINNEAPOLIS — Metro Transit’s paratransit services surpassed 8,000 rides on a single day for the first time in its history, the Star Tribune reports. The 8,123 rides on Dec. 3 helped Metro Mobility record its busiest week on record, with an average daily ridership of 7,500. Over the past three years, Metro Mobility has seen weekday ridership surge during the months of November and December, although the reason for it was not clear, according to the report. For the full story, click here.